With all the attention the iPhone 5s is getting, it was about time benchmarks of the device were leaked, and the source of the leak is no other than popular graphics benchmark GFXBench. Unfortunately, though, the device information the benchmark results gives us isn't plentiful. The device info on GFXBench's website only confirms the resolution (1136 x 640) and the presence of iOS 7, which were both more than known. The GPU name is only shown as "Apple A7 GPU", so there's not much that we can extract from that. However, deductions based on the little info Apple did provide us about the GPU indicate the A7's GPU could be a PowerVR 6 "Rogue" series GPU. On the T-Rex HD Offscreen test, the iPhone 5s gets a very good score, surpassing the iPhone 5 with more than 3x the performance (Apple claimed the iPhone 5s was just twice as fast as the iPhone 5 in graphics), and when compared to the Android crowd the iPhone 5s also does really well in this test, slightly surpassing the Nvidia Shield and only kept from the top spot by the Samsung Galaxy S4 with the Snapdragon 800 (GT-I9506). 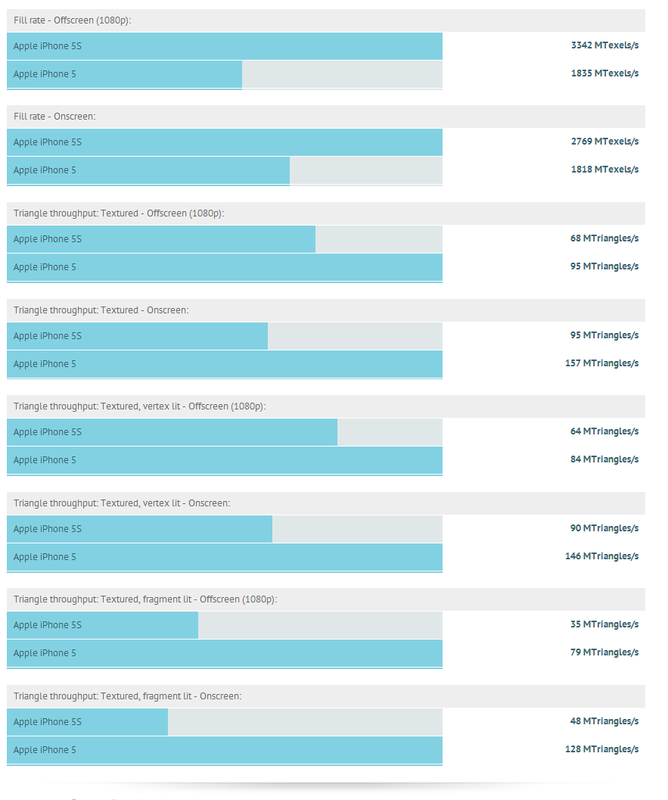 Onscreen T-Rex HD tests show, roughly, a 2.5x increase in performance compared to the iPhone 5, and is above every other Android device except for the Nvidia Shield. Moving on to the Egypt HD tests, the Offscreen test gets the iPhone 5s just shy of a 2x increase over the iPhone 5, but it has a lower score than many Adreno 330 and some Tegra 4 devices and actually has a very similar score to the iPad 4. The Onscreen test shows a bit more than a 25% increase over the iPhone 5 and is in line with many Adreno 320 devices which have a slightly higher 720p resolution and is significantly behind the Adreno 330-sporting Galaxy S4 and the Nvidia Shield. Fill rate, which has always been plentiful in Apple's GPUs, sees an unprecedented score in mobile, outperforming every other mobile device by a huge margin. Although, at the iPhone 5s' low resolution, the gains in fill rate won't be a factor in real-world gaming performance. Although I'm sure that the impressive fill rate of the Apple A7 will be of benefit to a very high resolution device, like the upcoming iPad 5. 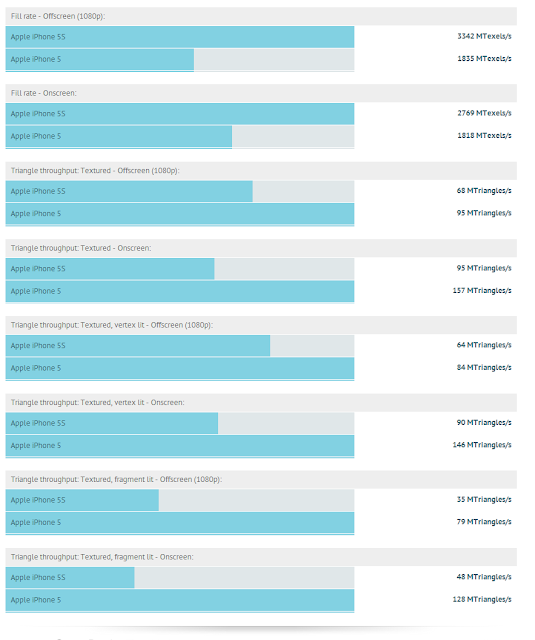 Interestingly, all of the Triangle Throughput tests get much lower scores than on the iPhone 5, iPad 4 and most PowerVR SGX MP-based Apple devices. If I had to guess, this is due to an architectural difference between that generation of PowerVR GPUs and Rogue. Basically, each module (read: core) of a PowerVR SGX MP GPU is an exact copy of each other, which means that each added module contained their own geometry hardware, so that the MP3 and MP4 (tri-core and quad-core) versions in the iPhone 5 and iPad 3/4 ended up with a lot of geometry compute, hence the insane Triangle Throughput scores these devices achieve. Rogue works differently. Each GPU module adds just shading hardware, so geometry hardware remains constant no matter how many modules you add. While this means Rogue devices will earn less impressive Triangle Throughput scores, it ensures that there'll be no unnecessary amounts of geometry hardware (let's face it, the iPhone 5 and iPad 4 had much more geometry compute than what would ever be necessary for a mobile device). 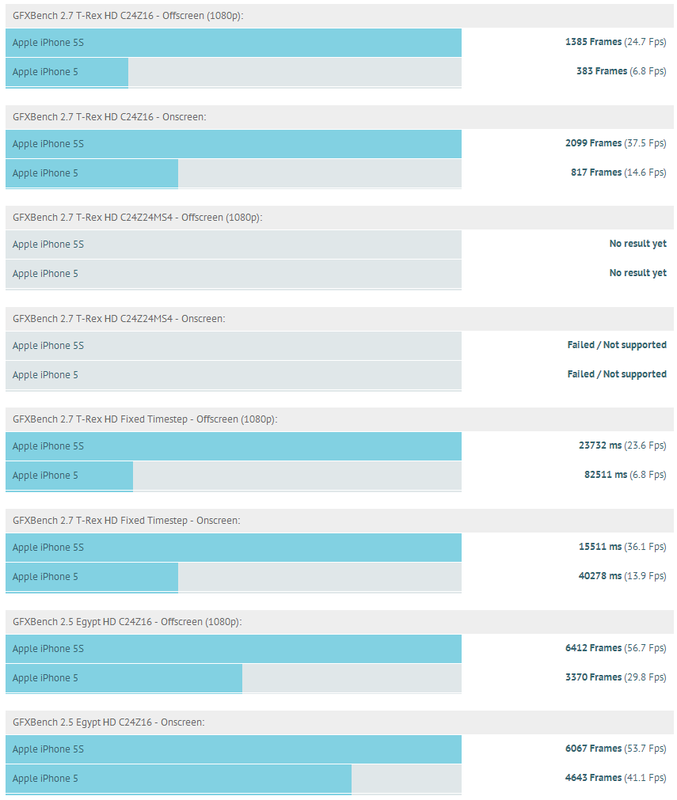 Nevertheless, the iPhone 5s appears to pack enough geometry compute to be competitive with other GPUs. Apple appears to have outfitted a very powerful GPU for the iPhone 5s. While this smartphone doesn't take the top spot in most tests, I suppose this will be the job for the upcoming iPad 5.